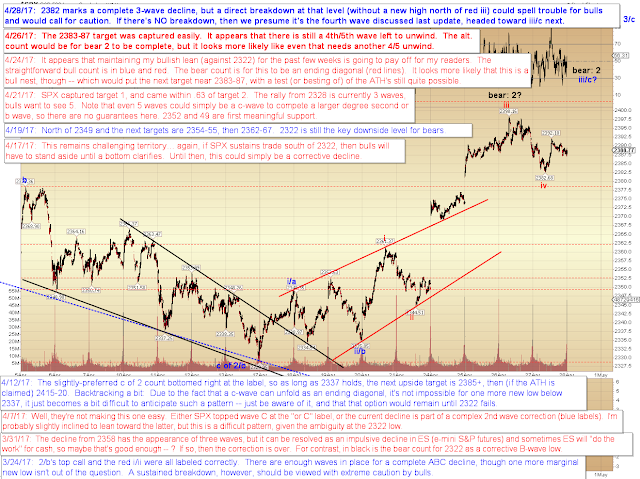 Last update discussed the potential for a fourth wave correction and fifth wave unwind, and yesterday's decline does fit the bill for a potential fourth wave. As long as that low holds, the picture remains bullish. 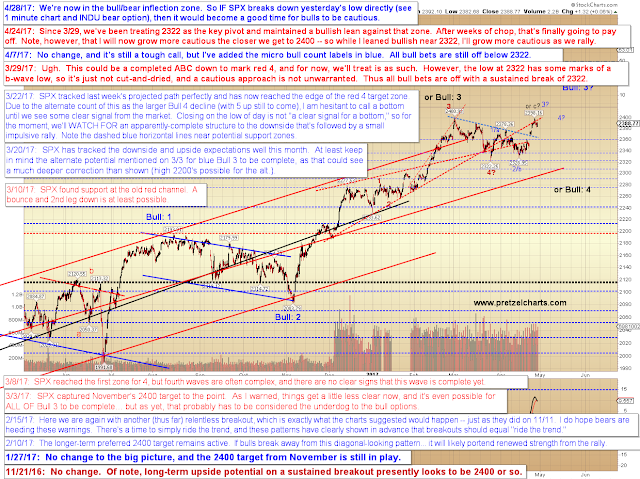 If that low fails prior to SPX breaking over 2399, then there is arguable good reason for bulls to be cautious. 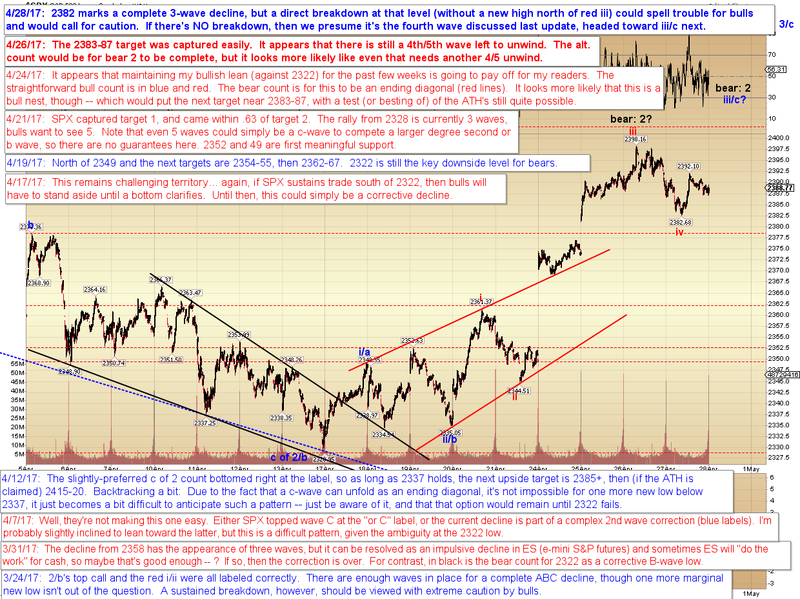 In other words, if you're ridden the rally this far, then that might be a good stop zone for at least partial profits. Toward the end of the update, we'll take a closer look at the bear option if yesterday's low fails directly. 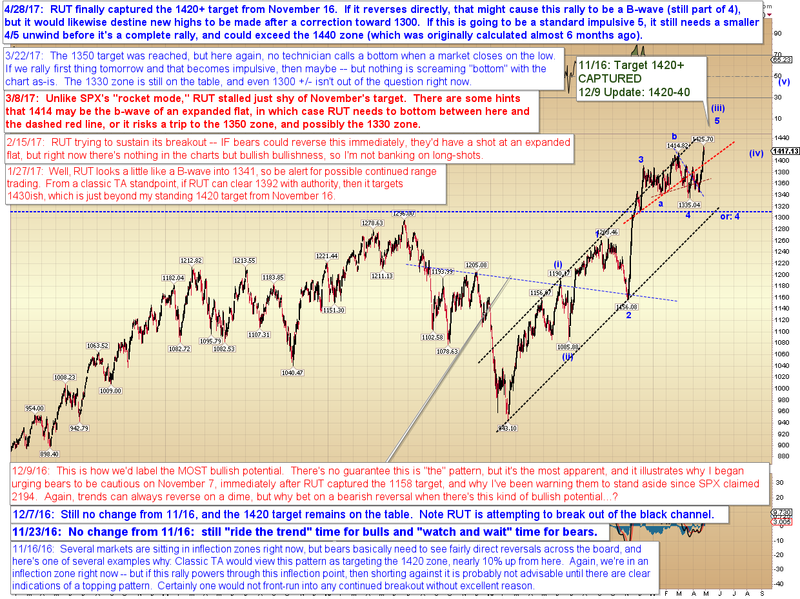 RUT has finally captured its 1420 target from November. I never really doubted that it would, the question was always one of "now or later?" That question still has some relevance, in the sense that if RUT were to reverse strongly immediately, then we'd have to consider the potential of an increasingly complex flat. The upshot for bulls would be that it's pretty hard to view the rally from 1335 to 1425 as anything other than a three-wave form right now, so we could be pretty confident of a solid buy op at lower prices (again, IF we formed the expanded flat). Now for a closer look at the bear option, for perspective on why an immediate breakdown at yesterday's low would at least call for a degree of caution. INDU and SPX are in basically the same count at intermediate degree, so they would be expected to track closely in a relative sense. 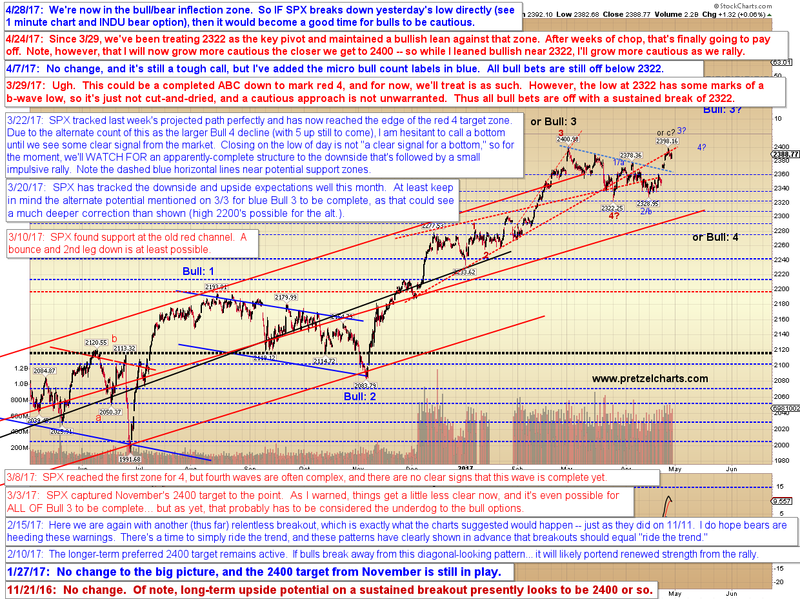 In conclusion, if yesterday's low fails directly, then some degree of caution would be called for. The harder pattern would be a rally up to retest the 2398 high, and THEN a break of yesterday's low, as that would have potential to be a flat -- so, as always, the idea of "sustained trade" below a key level becomes meaningful. ("Sustained trade" is not a short-lived break that fails to run anywhere and whipsaws, it is more when a key level is broken and then the zone around the key level begins to function as resistance or support.) 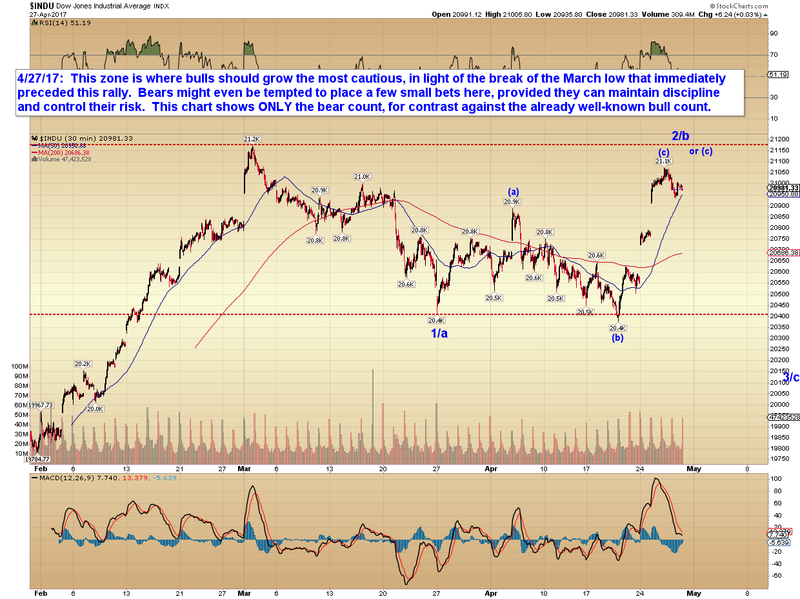 If yesterday's low holds, then the near-term will remain bullish. Trade safe.